I'm so excited to be a part of the 2014 Debut Authors Bash. Today we have an interview with the fabulous Jessica Love, author of PUSH GIRL, and don't forget to come back on 9/14 for an interview with the amazing Rebecca Behrens, author of When Audrey Met Alice! Could you give us an elevator pitch of Push Girl? JL: Kara, a high school senior and dancer, is hit by a drunk driver and suffers a spinal cord injury that leaves her paralyzed. As she adjusts to life in a wheelchair, she discovers who her true friends are and what she is really capable of. 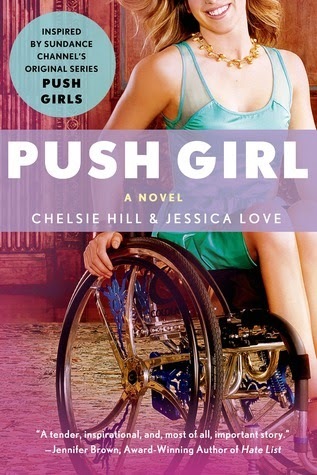 What inspired you to write Push Girl/how did you become involved in this project? JL: I became part of the project thanks to some brilliant agent/editor matchmaking. I was the perfect fit as a writer for the story Chelsie and the editors wanted to tell. I was really lucky the way it all worked out, because I absolutely loved working on this book. What was it like working with Chelsie Hill? Had you watched the PUSH GIRLS series before deciding to write this book? JL: I hadn't watched the TV show before I got started working on the book - I had never even heard of it! I didn't know what a fantastic show it is, and, honestly, I was a little hesitant about working with someone from a reality show because they can be a little trashy, you know? But as soon as I saw some episodes, I realized that this wasn't a typical reality show, and I knew that Chelsie was someone I would be so proud to work with. And I truly am. Chelsie is awesome! It was fun working with her and learning more about her story as we put this book together. What other research did you do in order to give PUSH GIRL such an authentic voice? JL: I used YouTube a lot. There are lots of awesome videos on there that helped me with what life was like for wheelchair users. One of the things I love most about Kara is that she is so relatable—her parents are getting a divorce and she has issues with her boyfriend, and most of all, she models how to overcome adversity. How did you balance Chelsie’s experience with fiction? JL: While this book is based on Chelsie's life, it's still fiction. Kara is a character, and she's not Chelsie, so I wanted to make sure that people who didn't have Chelsie's exact experience could still relate to her. We tried to put the focus on issues that were universal, so that anyone would be able to relate, and we sprinkled true pieces of Chelsie's story in with things that didn't happen to her at all. I think that helped to make Kara a balanced character who wasn't too much like Chelsie while keeping true to her origins. Do you have a favorite scene from Push Girl? Was there one scene in particular that was really challenging to write? JL: To be totally honest, the entire book was a challenge to write, mainly because I was SO focused on getting the realities of life as a wheelchair user right. There are so many types of wheelchairs and so many different reasons people use them, and I didn't want to alienate anyone. Also, as someone who is able-bodied, I didn't want the book to feel like it wasn't true to the realities of being a wheelchair user or that it read like it was written by someone who had no idea what she was talking about. Worrying about all of this seriously kept me up at night and made me sick to my stomach some days, because I SO wanted to get it right. All of my favorite scenes were between Kara and her ex-boyfriend, Jack. Jack ended up being my favorite character in the book because he was so cute and dorky and sweet. I wrote a few fun scenes between Jack and Kara that I knew wouldn't make it in to the book, just because I liked their chemistry and interactions so much. JL: I'm a plotter, but I'm not a very good plotter. I can't really write without outlining first, but I have to write a bad outline and a bad draft before I can really figure out what I'm doing. I'm a bit of a hot mess of a writer. Honestly, I'm surprised these books ever get written because I never really know what I'm doing. What was the biggest surprise you encountered during your journey to publication? JL: Everything about this book was a huge surprise! I never planned for it or expected it, so it turned my idea of what I thought my debut experience was going to be on its head. This whole experience has really taught me to stay open to unexpected possibilities. You never know what's going to come your way, and just because it isn't what you had planned doesn't mean you should count it out. Cool opportunities are around every corner! Finish even when it gets difficult. Finish even when you aren't sure what's going to happen next. Finish even when a better, cooler, easier, sexier idea comes along. It's in the finishing, in the going through even when it seems impossible, that you really learn how to be a writer. Do you have any other writing projects in the works? If so, can you tell us about them? Lastly, what other 2014 debuts are on your radar? Any book recommendations? My very favorite 2014 debut was Open Road Summer by Emery Lord. It's about best friends and travel and hot romance, which happen to be my three very favorite things. It's smart and funny and sassy, and I loved absolutely every word. If you haven't picked this book up yet, you need to. I'm also really looking forward to Damsel Distressed by Kelsey Macke. It's out next month, and it's going to be awesome! Thanks again to Jessica for answering my questions! Want to win a copy of PUSH GIRL? Enter the Rafflecopter giveaway. Open to US entrants only, please. *grins* My name is Kara! I'm sold! My favorite 2014 debut this year so far is. . . I can't pick! So far I've read Dream Boy, Essence, Hexed, These Gentle Wounds, and preordered Sweet Unrest. They all had a really creative idea. I was thrown. I look froward to other releases from these authors & hope for more in YA! Hmm, I'm not sure I've read a lot of 2014 debuts... I've been reading quite a few 2014 releases this past week, but none are debuts. Oh, I know, I read The Nethergrim and thought it was quite good. There are a bunch I really want to read, including The Glass Sentence, Otherbound, and Lies We Tell Ourselves.